It’s 1973, Spiro Agnew has just resigned as Vice President. Republican President Nixon appoints Gerald Ford as his replacement, but the Democratic Senate and House of Representatives, following the precedent set by future Republican Senate Leader, Mitch McConnell, refuses to hold hearings or consider the nomination, saying the next election is only 3 years away, and the voters should decide. A year later, President Nixon, refusing to resign, is instead impeached by the House and convicted by the Senate for crimes relating to the Watergate break-in. Speaker of the House Carl Albert assumes the role of Acting Presidency. He refuses to pardon Nixon, who serves time in jail. Albert is re-elected in a landslide in 1976. This didn’t happen of course. But it could have, and something like it could still. It would not necessarily be a bad thing, but it’s not really what the founders envisioned, and surely there is a better way. The US Constitution is in some senses a great document, it has preserved a democrat-ish government for over two centuries, the longest in the world depending on how you count democrat-ish. But it is also deeply flawed in many ways, and it’s in some ways surprising there has only been one civil war given the structural weaknesses. The notion of checks-and-balances is great, until it leads to gridlock, which is fine, until it would actually be useful for the government to do something. According to the Economist Democracy Index, at least 20 countries are more democratic than the US. Some of them because they have better people, perhaps, who behave in more democratic ways, but mostly because that have better institutions and constitutions that encourage and allow people to behave better. Imperial Presidency. (This is up to Congress and the Courts in large part, but there are Constitutional reforms that can reign it in — see below.). Bizarre Electoral College rules (Just make Congress the Electoral College, and eliminate the so-called “popular election” of the President, it would be a huge leap forward toward a Parliamentary-style democracy with a minimal change to the actual Constitution). Unrepresentative Senate. (If it can’t be strictly proportional for political reasons, then each state should still get a minimum of 2, but then each 3.2 million people gets an additional senator, who would still be elected statewide. Essentially this doubles the size, but the new members are all proportional to population.) (Alternatively, each State automatically gets 1 Senator, and 1 more for every 6.4 million people, if the desire to keep the Senate at a more manageable 100 Senators is preferred, or 1 per state + 1 for every 2 states + 1 per 4.8M if we like Dunlop’s Number of 150 Members). In practice this many reforms could only be achieved with a Constitutional Convention, and everyone is afraid to do that since the first one was so successful at overturning what went before. But really, if it were so bad, the reforms would not be subsequently adopted by three-fourths of the states. I have steered clear of substantive issues (gun control, abortion, budgets) which should be dealt with politically, and instead focused on process issues which the political system cannot easily self-regulate. Measuring benefits and costs can be tricky, but it is not impossible to get a first order estimate, and the general principle is straight-forward. Sadly almost no agency requires actual benefit/cost analysis. Consider the full benefits and full costs of the project (in comparison with a no-build alternative) incorporating changes in: number of passengers and freight, travel time and travel time reliability, accessibility to employment and workforce, land value, wider economic benefits, crashes and crash severity, air, water, land, noise, pollution costs, and carbon emissions, public health (including both physical activity and pollution levels), vehicle operating costs, as well as the costs of building, maintaining, and operating the project over time. Consider these costs and benefits not only for the project, but for the relevant portion of the transportation network, including related transportation sections both upstream and downstream of the project and competing with the project. These analyses must be performed according to a standard methodology published by the Department of Transportation (DOT). The methodology and analyses shall be reviewed every two years by a national panel of transport and economics experts convened by DOT. The results of these analyses, including both the final results as well as the component estimations, shall be made public and posted on the DOT website in a readily accessible manner. An Annual Report of considered and selected projects shall be provided with the full benefits and full costs reported, and justification provided for any projects that were selected over other projects with higher expected benefit/cost ratios. The project-delivering agency shall review project cost estimates made at the time the project was approved for construction upon completion of the project, and report to the Legislature a table of expected and actual cost expenditures for all projects. The agency shall review travel demand estimates made at the time the project was approved for construction 5, 10, and 20 years after completion of the project and report to the Legislature a table of expected travel and actual travel for all projects. 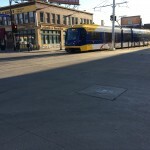 The Transportationist is on MPR’s Daily Circuit. Today 10 am Central. I will be having a live in-studio conversation with Kerri Miller on MPR’s Daily Circuit Today (Tuesday October 14 at 10 am Central Time). The other guest is Adie Tomer of the Brookings Institute/Metropolitan Policy. Topics are likely to include transportation issues in the midterm elections, big ideas for transportation’s future, how those ideas get paid for, and who the constituents are in that conversation. In the Oct. 9 gubernatorial debate, Gov. Mark Dayton and his two opponents named transportation on their list of priorities for the next four years. Dayton proposed a gas tax increase to pay for his transportation plan, but how to pay for all that’s needed for roads and bridges is a problem that vexes politicians nationwide. On The Daily Circuit, we talk with two transportation experts about the economics of transportation planning. MAP-21, the 2012 federal surface transportation authorization bill, is set to expire later this year. Meanwhile, the Highway Trust Fund faces an insolvency crisis due to rapidly dwindling gas tax revenues, and there appears to be little agreement in Congress on how to fund the federal transportation program. Some say that makes this year ripe for a reconsideration of the federal role in transportation and have proposed devolution of the federal program to the states. Many states continue to rely on the federal government for a significant portion of their transportation spending, however, and might be challenged to come up with revenues on their own from a limited tax base. This eCademy examined the pros and cons of devolution, the future of the federal role in transportation and what it could all mean for state and local governments. Download Prof. David Levinson’s slides in PDF here. 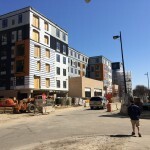 Cross-posted from streets.mn: Seven types of urban redevelopment sites. Riding the #16 back from the streets.mn Writers Conclave, one sees that the Green Line (nee Central Corridor) has left a path of destruction in its wake. From downtown Minneapolis to past the edge of the University of Minnesota, parking ramps, the Star Tribune headquarters, the Metrodome, and WaHu are just some of the largest redevelopment sites oriented toward this line as Minneapolis strives to become Manhattan(or perhaps we should say Maxiopolis). Before we are too quick to credit transit investment as the cause of the development, note that even off the line, in places like Uptown, the Wedge, and Dinkytown, the 2010s say out with the old and in with the new. Yet regardless of the causes of redevelopment, it is here, it is generating controversy, and that controversy in part is a result of insufficient policy tools. The examples are far from a complete list, and certainly there will be debate about what constitutes 5, 6, or 7, and lots of nuance and qualitative decisions. Nevertheless, I think we are far too quick on type 6 and especially type 7 sites when there are so many sites still remaining in categories 1-5 in much if not most of the city. An aerial view of Dinkytown, e.g. will show that surface parking lots are disappearing. It will also show they have not already disappeared (the block between 14th and 15th Avenues and 5th and 4th Streets is more than half parking). A key lesson is that it is often easier to grow an urban neighborhood from an existing lattice of structures than try to plop one down on a brownfield site. … Thus we should try not to destroy viable structures or neighborhoods until we have considered renovating them and we have exhausted vacant parcels. Of course, one might say, that is the obvious lesson from urban renewal some 50 years ago. But this still happens: The old Marshall HS in Dinkytown, e.g., or the Colonial Building at Emerald and University on the Central Corridor that has been a vacant parcel for about 7 years now. While construction is well-underway on the Marshall HS site, the Emerald and University site (variously 2700 The Avenue or City Limits Apartments) sits fallow. 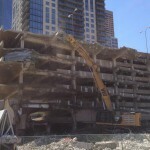 Things might happen between demolition and construction, so that construction which was planned falls through mid-project. Consider a simple two-block walking route. One block (X) is a functional, occupied one-story building (with doors and windows) and one block (Y) is a zero-story parking lot. To go from A to B one passes the building (which might be interesting), and a parking lot (which probably is not). Now a developer comes in and wants to build a non-awful six-story wood frame apartment building. Where would you rather have him build this. The answer is block Y because then when you are walking, you will walk past two buildings, instead of one building and a parking lot. 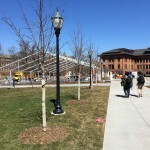 This improves walkability, which is a good value to have, since it likely increases walking, personal connections with the city, and even retail sales; but it also improves accessibility (the number of places which can be reached in a given unit of time), which produces positive economic spillovers in the interim. A six story building plus a one story building is better than a six story building and a parking lot. In the end, both blocks may have apartment buildings, that is fine. But you want to develop the empty lot first because “in the end” is not “right away”, as the recession of 2008-09 showed, and we are losing urbanism in the interim as projects can get deferred a long time. The sequence of development matters. In the interim, the walk accessibility (local density) will be higher when the empty lots are developed before existing buildings are torn down and replaced. Property is private, and developers should (in order to maintain political stability by ensuring a consistent legal framework (i.e. the US Constitution) that guarantees property rights) be allowed to develop what and where they are legally permitted. But cities intervene in these markets all the time, both through zoning codes (police powers) and subsidies (purse powers). There are a number of solutions to improve the sequence of development. The land value tax is one, but that has political difficulties in that it creates winners and losers compared to the baseline. Another idea in this regard is the awarding of Transferable Development Rights on existing #6 and #7 sites that are built less than code allows, which can be transferred to vacant lots to allow those parcels to be developed more intensely. (Thus compensating the sellers for not developing right-away). These would temporary rights, so if sold, the selling parcel would not be able to be redeveloped more intensively than its current structure (for a period of time (e.g. 10 years)) without either buying rights from other properties, or waiting until the expiration. Of course the buyer would get to build somewhat more intensively than current zoning allows as a permanent structure (so even after the rights expire for the seller, the buyer does not need to unbuild their building). These kinds of rights are used for agricultural parcels in many places, to preserve agricultural uses in places where it might otherwise be developed into a subdivision as a matter of right. These are also used for air rights developments. So imagine our scenario above. Instead of redeveloping right-away, the owner of Parcel X sells to the owner of Parcel Y a TDR that defers development on Parcel X for 5 years and gives Parcel Y one extra story. Parcel X gets enough revenue to put off development. Parcel Y may now be slightly more financially feasible with the density bonus. The community gets more walkability in the interim five years. The only prospective downside is if you don’t like the additional density. TDR donating / receiving areas can be downzoned as part of the package to ensure the end state is no denser than it otherwise would be (so the as-right development would only be 5 stories, with the 6th story coming from the TDR).